You may remember a while back at IFA 2012 in Berlin, old Sammy launched the Samsung Galaxy Camera, a camera that sports the Android operating system along with a 4.77-inch HD Super Clear Touch Display. And for those over here in the United Kingdom that have had their eye on the Sammy built snapper, you might like to know that you will be able to pick up the device in just three days time. 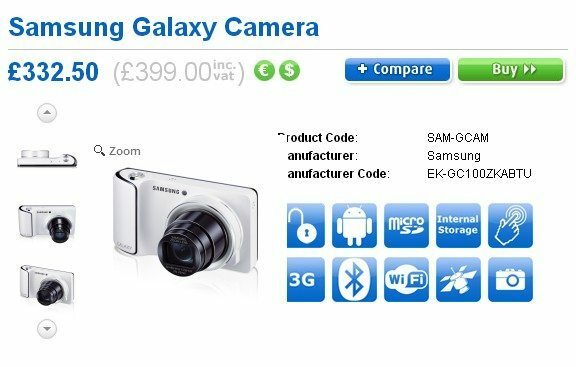 According to a report over on Slash Gear, Samsung has announced the Samsung Galaxy Camera will become available in the UK on the 8th of November, and for those UK hopefuls that might like to pre-order the Galaxy Camera, Clove has the device up for pre-order in both black and white at a price of Â£399 including VAT. However; apparently Jessops is also offering the Samsung Galaxy Camera in both white and black for Â£399.99, but you also receive a free 8GB microSDHC card when you pre-order the device. The Samsung Galaxy Camera features along with that touch display a 16.3 effective megapixel 1/2.3-inch BSI CMOS lens, a 1.4GHz quad core processor, 8GB memory, memory card slot, HDMI 1.4, 10 modes, Share Shot, Smart Pro feature, auto-cloud back-up, 3G and 4G connectivity, WiFi a/b/g/n, GPS/GLONASS, Bluetooth 4.0, the usual Google services, sports a 1650mAh battery, measures 128.7 x 70.8 x 19.1mm with a weight of 305 grams, and runs Android Jelly Bean 4.1. The Galaxy Camera also comes with some software enhancements such as the ability to shoot in slow motion, edit videos, operate the device via voice commands and of course the camera can use many Android applications. On a side note, if you have had your eyes on the 64GB Samsung Galaxy S3 in black, Clove also has that handset up for pre-order as an unlocked and SIM free handset commanding a price tag of Â£600, although they do not state when the smartphone will be in stock, but you can enter your details to be notified. Will any of our UK readers be snapping up the Galaxy Camera or Galaxy S3 in black?